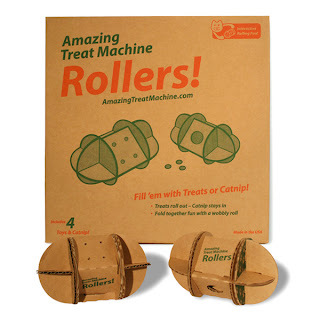 Catsparella: Charlie's Amazing Treat Machine Rollers Super Giveaway Winners! Charlie's Amazing Treat Machine Rollers Super Giveaway Winners! #15 Cheshire Pat, who said, "Woo! This is too much silly fun! My guys would love a chance to carpet-test them." #52 Teri and the cats of Curlz and Swirlz, who said, "We luv, lurve, luff and love chewing on cardboard and Disco says if there is a treat involved, even better!" #20 Kaitlyn B., who wrote, "My cat Nicky loves to play with toys that have treats or catnip in it. That may be why I always find them destroyed the next day." A big congrats to all of the winners and their fortunate felines! Click here if you're interested in learning more about Amazing Treat Machine Rollers, and don't forget you can get 25% off your order by entering in code CATSPARELLA at checkout! Charlie can hardly contain his excitement! We B So Happy! We are chewing in anticipation of this prize!! Thank you for holding the contest and for Mr Randomorg for picking us, hahameow! Hahahah! 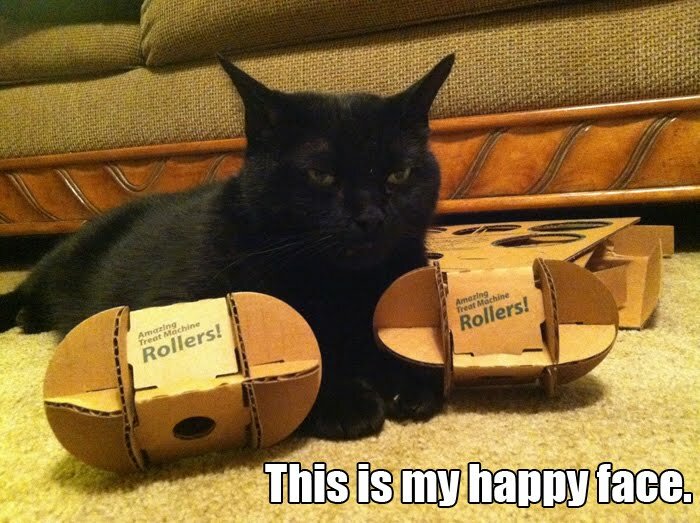 Your happy face is hilarious!!! Kisses! We're all thrilled here at Casa Cheshirepat! Pictures will ensue, as will the fun! Awesome toys! And congrats to all the winners!